So, what was Passover? In Exodus 12, we read about the first Passover. The Israelites were living in slavery in Egypt. God wanted to free them, so He sent Moses as His messenger. However, the Egyptian Pharaoh did not want to lose his slaves and refused to let them go. God sent nine plagues to convince Pharaoh to let His people leave, but Pharaoh wouldn’t listen. So, God sent one last plague. The plague was that the firstborn male in every family was to die on a specific night. The only way to escape this plague was to put the blood from a male lamb on the sides and top of the outside door of the house. When the death angel saw the blood, he would “pass over” that house, and everyone inside would live. Jesus said in Luke 22:19, “Do this in remembrance of Me.” Therefore, all believers may receive Communion, or the Lord’s Supper, at the instruction of Jesus. The Bible doesn’t instruct that there’s a set time or place to participate in this memorial. A certain person does not have to officiate. 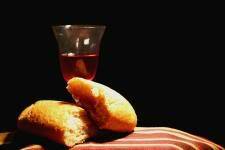 You can take Communion in a church service, at home with your family or by yourself. It is a holy time to remember what Jesus has done for you. What do think about when you partake in the Lords supper? The next time you receive this special meal/ remember that Jesus’ body was broken & His bloodshed for you; & celebrate that your sins are completely forgiven, Rejoice that one day He will come back. Receive the healing, restoration & strength that He purchased for you with His body & blood. Father God, in the Name of Jesus, we recognize that Jesus’ body was broken for us, that His blood was shed on our behalf. We acknowledge that He carried sin, sickness, disease, sorrow, grief, fear, torment, unforgiveness, strife and lack for us. Through His sacrifice for us, we have complete forgiveness and cleansing before God and total deliverance from the works of Satan. And, we thank You for it all, in Jesus’ Name. Now, accept everything Jesus’ sacrifice provided. Call yourself forgiven. Rejoice that God holds nothing against you, and withholds nothing from you that you ask for that’s His will. Thank God that Jesus prays for you, and provides for and protects you. Be glad that God has made you worthy to be called His child. Also, refuse to accept sickness and disease. It’s from Satan, so reject it. Refuse to receive it any longer. You are partaking of the sacrifice of Jesus’ body, so receive the healing He provided, in Jesus’ Name. God & the Old Covenant were about to be forever satisfied. A new & living way into the presence & provision of God was being prepared through Christ, the Lamb of God. A new eternal bond was being established by the blood of Jesus Christ. God was soverignly inaugurating the new ultimate covenant. Finally, thank God for what He has provided for you through Jesus Christ. Acknowledge that you are blessed. Praise God for His exceeding great and precious promises, and the fact that you have the right to enjoy those promises. You are healed! You are redeemed, and you are delivered from the authority of darkness. You have been accepted and moved into the kingdom of God’s dear Son. You are the head and not the tail. You are above only and not beneath. You are not left out of anything good. All that you do, prospers. Praise God in Jesus’ Name for the new life you enjoy! * Read 1 Corinthians 11:23-26. What stands out to you the most? * Make an outline of the steps to receive Communion. * Determine what you will expect as you receive Communion. Though Pharaoh didn’t pay heed to the first nine plagues, this tenth one got his attention. He let God’s people go. God commanded that this event be celebrated each year as “Passover,” so the Israelites would remember God’s great deliverance in bringing them out of Egypt and slavery. Celebrate the Lords supper often. Approach it with faith, receiving the life & healing it provides. The punishment Jesus took in His body was not just an exercise in suffering. Every lash of the whip was a provision for healing. As the leather straps marked His flesh, which was to heal cancer. The metal barbs cut his skin—that was to heal diabetes. Again, the whip fell across His back—that was for healing of mental anguish. The whip ripped into His muscles—that was to replace crippled limbs. And on and on it went. Jesus was whipped so you could be healed. It’s simply a matter of believing and receiving this provision of God. Jesus also said to drink the wine, or grape juice, to remember that His blood as a sacrificial offering would establish a new agreement: God’s acceptance of men as His children. Jesus’ death and resurrection made a way for us to have a relationship with God. Because of what happened in the Garden of Eden with Adam, we were born separated from God by sin, and there was no way to bridge the gap. We couldn’t get free from the punishment of sin without dying. Jesus took our punishment and died—He paid for our death with His death, so we can live as children of God. His act has caused us to be forgiven and right with God. You see, Jesus is the final, perfect Passover Lamb. He fulfilled the requirements as set forth in Exodus 12. He was a male, unblemished by sin, and He was willing to die in our place. When we accept the perfect sacrifice of Jesus in our life, His blood causes the death angel to pass over us.